A number of challenges exist in providing adequate health care at a mass gathering. Health providers aim to maximise their efficiency in responding to health emergencies within the mass gathering environment, whilst minimising potential impact of surge presentations to the health service in the surrounding community or region. The mass gathering literature commonly reports on the onsite care from single events, and does not consider the effect on prehospital or hospital services. This research aims to enhance our understanding of the health service requirements of an outdoor music festival. Design: Retrospective review of patient report forms from onsite health services at outdoor music festival. Setting: One outdoor music festival in 2012 in the Australian Capital Territory with approximately 20,000 participants. The festival had one first aid post and a health team staffed by doctors, nurses and paramedics. Data collection: Data was obtained and linked between onsite care providers (St John Ambulance Australia), prehospital (ACT Ambulance Service) and hospitals (Canberra Hospital and Calvary Health Care ACT). A pre-existing and used minimum data set1 was used to code patient characteristics from this event. Data analysis: Descriptive statistics such as frequency distributions and means of central tendency. This is a summary of some of the key findings. Onsite first aid care: The most frequent illness was headaches (n=94), injury was superficial lacerations (n=13), environmental was substance and/or alcohol intoxication (n=12). Onsite health professional care: The most frequent illness was headaches (n=3), injury was fractures (n=2), environmental was substance and/or alcohol intoxication (n=12). Ambulance transport: The most frequent injury was fractures (n=2), environmental was substance and/or alcohol intoxication (n=4). One patient required prehospital endotracheal intubation, Three patients required airway adjuncts, Six patients received intravenous medications from paramedics including opioids. Hospital services: One patient required an open reduction and internal fixation in the operating theatre. One patient required intubation and ventilator support in the Intensive Care Unit. This is the first research to describe patient presentations to onsite care providers, prehospital services and hospitals from a mass gathering. This research provides insight into the health service usage from one event. Presentation to the onsite health professionals resulted in a longer length of stay in the onsite medical facility. Onsite health professionals may have diverted 15 patients who would have otherwise been seen by local ambulance and hospital services. Multi-site research should be undertaken to explore the health service usage from a variety of mass gatherings. Ranse J, Lenson S, Keene T, Luther M, Burke B, Hutton A. (2014). 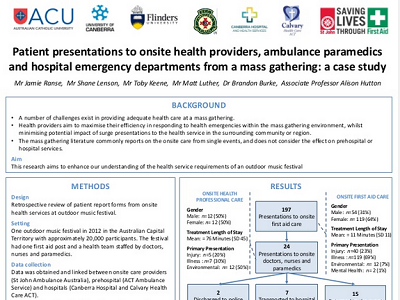 Patient presentations to onsite health providers, ambulance paramedics and hospital emergency departments from a mass gathering: a case study; poster presented at the Paramedics Australasia International Conference 2014, Gold Coast, Australia, 18-20 September.